We’d love your help. Let us know what’s wrong with this preview of Have a New Kid by Friday by Kevin Leman. Every kid in America will hate this book! But moms will love it! Tired of defiant attitudes and power struggles with your little ankle-biters? Then you need this book. With his signature wit and wisdom, internationally recognized family expert Dr. Kevin Leman reveals why your kids do what they do and what you can do about it. He gives you simple principles that can give you results in as little as 5 days. To ask other readers questions about Have a New Kid by Friday, please sign up. By the end of the summer I was losing my mind with my older daughters, ages 9 and 7. This book suggestion popped up in a weekly e-mail, and I really needed new kids by Friday - if not sooner! A few chapters in, (I read more than one a day - I need to get the program going! )I really like the common sense approach, and the fact that you are shaping attitute, behavior and character - they are all intertwined. I started changing my approach already today, and we made it all the way to bedtime with n By the end of the summer I was losing my mind with my older daughters, ages 9 and 7. This book suggestion popped up in a weekly e-mail, and I really needed new kids by Friday - if not sooner! A few chapters in, (I read more than one a day - I need to get the program going! )I really like the common sense approach, and the fact that you are shaping attitute, behavior and character - they are all intertwined. I started changing my approach already today, and we made it all the way to bedtime with no yelling or crying - hooray!! Now, seven days later, my house is a new place. I haven't raised my voice all week, my children have been apologizing for bad behavior, my three-year-old is staying in her bed at bedtime, and they are picking up after themselves. WOW. If you really stick to your guns, and FOLLOW THROUGH every time (with Leman's method of B doesn't happen until A is completed), instead of 'threaten' punishment (a mommy bad habit), the kids really learn that mom means business. Read this book if you really mean business, and are willing to be punished yourself a little bit (like, if you were going to take the kids to the movie, and you need to take away the movie,it does mean no movie time for you - not, well, we'll still do this one thing and then I'll take away the next thing.). Consistency goes a long way and I'm surprised at how quickly I earned my childrens' respect back. I've even seen a lot more hugs from my nine-year-old. Confession--this was a book my husband INSISTED that I read, not one that I picked out by choice. I have to say that overall, I felt that Leman only made two valid points throughout the entire book, and that the rest was just filler (or letters from "grateful" readers, plugging this book). The first point that I felt merited some thought was to not encourage/engage in arguing with your child. Later, when they want some favor or treat, you say "no"--if they ask why, you explain--once--that you di Confession--this was a book my husband INSISTED that I read, not one that I picked out by choice. I have to say that overall, I felt that Leman only made two valid points throughout the entire book, and that the rest was just filler (or letters from "grateful" readers, plugging this book). The first point that I felt merited some thought was to not encourage/engage in arguing with your child. Later, when they want some favor or treat, you say "no"--if they ask why, you explain--once--that you did not appreciate the way they spoke to you earlier. The second valid point, IMHO, was "B doesn't happen until after A"; obviously used for a variety of scenarios. I felt that most of this book was redundant after the first 1/3, merely hammering in points that the author already stated. If you actually pay attention to what you're reading, you've already gotten his points by then. It was also filled with "real-life situations" to simulate the points, that I felt were a complete waste of time. After all, everyone's situation is different, and what someone else's child says to their mother isn't the same things my child are saying to me. The biggest turn off (after the redundancy factor), was the letters from people exclaiming how great the book is--seriously, if it is that great, I don't need 1/2 of the book filled with other people saying that--just give me the facts. One thing that stood out to be was a little section on shyness. His assessment of shy kids is WAY off. I was painfully shy as a child, largely due to fear and emotional immaturity. Shy kids need all the help they can get to gain confidence and overcome their fears, and telling them they're selfish is a bizarre way to do that. I've learned it's a very bad idea to back kids into a corner and force them to take steps on YOUR time table rather than theirs. I picked this book up thinking of my brother's children, actually. Their behavior is so bad my kids come home with a 'tude just from spending the night! -the *main section* of the book is really only 1/3 of the total. Sounds like he didn't really have that much to say. -his "advice" on manners boils down to "you should really teach your kids some". Wow. -he uses the phrase "purposive nature of the behavior" WAY TOO MUCH. Um, just say "purpose of the behavior" or even "reason they do that is...". We'll know what you mean and not feel you're trying to impress us. I didn't care for this book. He's a little too conservative for me, although that's not my main issue. My main problem with his parenting advice is that much of what he recommends to correct or change a child's behavior shame-based. He says if you allow your child to be in a situation where he is ashamed or embarrassed in front of his peers, he will quickly change his behavior. The LAST thing I want to convey to my children is a sense of shame. The main purpose of how I parent is to teach them t I didn't care for this book. He's a little too conservative for me, although that's not my main issue. My main problem with his parenting advice is that much of what he recommends to correct or change a child's behavior shame-based. He says if you allow your child to be in a situation where he is ashamed or embarrassed in front of his peers, he will quickly change his behavior. In surfing bestsellers this came up. The title seemed so funny that I had to get more info. After reading the book and testing out some of the ideas in a modified way in my classroom, I have to say that this stuff really does seem to work as far as getting difficult kids to see that it is time for them to change. Not only did it give me some new techniques for working with kids, but the advice that really helped me was that of not feeling guilty about offering true guidance to kids, which sometim In surfing bestsellers this came up. The title seemed so funny that I had to get more info. Excellent resource that every parent should read! Even if you do not have a "trouble" child, this book gives excellent ideas of how to build good attitudes, behavior, and character in your children. It also helps you discover what kind of parent you are and what changes you can make in yourself to be a better parent! It is a helpful resource for anyone working with children as well. The techniques and lessons can be applied to the children you work with. Years ago I spied a friend reading a book titled, "How to Make Kids Mind Without Losing Your's." I was intrigued ;D, but I never got around to borrowing it. A few weeks ago I saw this book, by the same author, lying in our Library Sale stack. What a gem! Mr. Leman is clear and to the point. A few things I especially appreciated is the way he placed focus on the need your children have for time with you (building relationship.) They might not be conscious of this, either because they are 2, 12, or Years ago I spied a friend reading a book titled, "How to Make Kids Mind Without Losing Your's." I was intrigued ;D, but I never got around to borrowing it. A few weeks ago I saw this book, by the same author, lying in our Library Sale stack. What a gem! Mr. Leman is clear and to the point. A few things I especially appreciated is the way he placed focus on the need your children have for time with you (building relationship.) They might not be conscious of this, either because they are 2, 12, or 20 - but you need to be. The advice he offers for dealing with the trouble you'll run up against is simple, clear, and direct. Initially, he goes through it a day at a time - Monday through Friday; but he offers a number of follow up, easy to grasp, and better yet easy to re-reference sequential reminders. The last part of the book deals with various problem issues on an individual basis. I'll go through these as I need them or when I am in preparation mode - 'cause sometimes you can just see it coming. Every parent needs this book - for their sanity and the sake of their family. Addendum: knocked the star level down one. As I referenced back for a few challenges I've been facing, I found that Mr. Leman was a bit on the light side at times, coming up rather non-directive or (in my opinion) pointing in a direction that wasn't particularly helpful. For example, on the issue of disrespect, the bottom line was to make sure you are treating your children with respect. Ok... now what? Seeing as this is a critical relational issue, among a few others, he got a small demotion from me. Very good, but also VERY difficult to put into practice. Goes against a lot of the general ideas of how a lot of us parent today. I never thought of praising my kids as doing them a disservice, but after reading his thoughts, I agree. Encouragement is good, but that is different than praising, which is what most of us do. The first chapters are about the general principles of his parenting theory, which I would sum up as parents need to stay in control, not get angry, say it once and walk away, Very good, but also VERY difficult to put into practice. Goes against a lot of the general ideas of how a lot of us parent today. I never thought of praising my kids as doing them a disservice, but after reading his thoughts, I agree. Encouragement is good, but that is different than praising, which is what most of us do. The remainder of the book is how to handle kid issues, an alphabatized list from fighting to disrespect to getting kid's cell phones to messy bedrooms. On my quest to improve my parenting, I have read many, many, many, many books. A lot were really good, some were just ok. 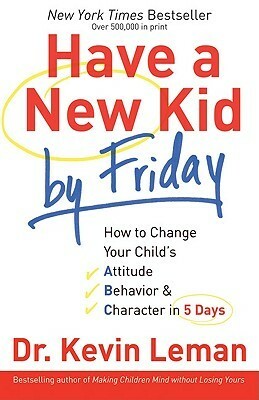 I just read Have a New Kid by Friday by, Dr. Kevin Leman. It was pretty good. I would give it 4 or 5 stars. Easy to read, simple steps to implement, reminders of what really I already know, but it is often so hard to DO what we know we should. I guess I don't know for sure if it works yet, because as we all know, it means I need to change, in order for it to work. Jenn is doi On my quest to improve my parenting, I have read many, many, many, many books. A lot were really good, some were just ok.
Jenn is doing Love and Logic and I think it fits well with that. It is the summer of getting our children to have better behavior. It was well worth checking out Have a New Kid by Friday, of the library and reading. I don't know that it would work great for a 2 years old and younger, but 3 and up, great tools. I also enjoy watching Super Nanny to inspire me to be consistent! Consistency is in the top 10 parenting rules in Have a New Kid by Friday. - It makes false assurances of 100% effectiveness that make it sound unnecessarily like snake-oil. "Just walk away— your child *will* back down" is advice that succeeds most of the time, but does sometimes fail. Giving no backup plan simply will leave many parents in the lurch. In the end, this is an amusing, effective if well-padded pamphlet of greatest appeal to those who share the author's subculture, and who have enough support to be able to navigate areas that the book fails to address. Here's what would happen in real life: Matthew was stunned. He screamed for 2 hours and threw a chair at the wall. Or: Matthew was stunned. He argued all afternoon, all night, and continued arguing until his parents were so exhausted they dropped dead and he ate the cookies. I may exaggerate a little. But I know for damn sure that if I told Miss 6 that if she didn't get dressed quickly she'd have to wear her pyjamas to school she'd say, "fine, and I'm not wearing shoes either!". What stuck with me the most from this book is: if Dr Leman ever gives you a ride somewhere, you'd better say thank you. At least three times. But spitting out his car windows is a-ok. Seriously, aside from a random rant warning against nursing past one (how does this have anything to do with discipline?) and some rather horrifying advice (lock a kid who refuses to stay in bed outside for 10 minutes) the guiding principle of this book is good (when B, then A). I tried it last night after finishing What stuck with me the most from this book is: if Dr Leman ever gives you a ride somewhere, you'd better say thank you. At least three times. But spitting out his car windows is a-ok. I'm still waiting for my new kid to arrive in the mail. My son saw the book and actually asked if we were going to get a new kid. I told him that yes, we were going to get a new kid.....to replace the old ones....he thought that was so funny. So far this book has reminded me of the things I need to do instead of giving my kids five hundred chances or warnings. I hope to put it to work and then maybe I should rate it. It was definitely an easy read. Dr. Kevin Leman, an internationally known psychologist, radio and television personality, and speaker, has taught and entertained audiences worldwide with his wit and commonsense psychology. The best-selling and award-winning author has made house calls for hundreds of radio and television programs, including The View with Barbara Walters, The Today Show, Oprah, CBS's The Early Show, Live with Reg Dr. Kevin Leman, an internationally known psychologist, radio and television personality, and speaker, has taught and entertained audiences worldwide with his wit and commonsense psychology. The best-selling and award-winning author has made house calls for hundreds of radio and television programs, including The View with Barbara Walters, The Today Show, Oprah, CBS's The Early Show, Live with Regis Philbin, CNN's American Morning, and LIFE Today with James Robison, and he has served as a contributing family psychologist to Good Morning America. He is the founder and president of Couples of Promise, an organization designed and committed to helping couples remain happily married. Dr. Leman is also a charter faculty member of iQuestions.com. He has written over 30 best-selling books about marriage and family issues, including The Birth Order Book and Sheet Music: Uncovering the Secrets of Sexual Intimacy in Marriage. Dr. Leman and his wife, Sande, live in Tucson. They have five children.